The bill trotted out in front of cameras at a press conference last week claiming it was about ‘safer schools’ and ‘healthier kids’ looks just like another one that was shuffled off to a Senate committee to die. The previous bill was about enacting ‘extreme risk protection orders’, which is basically accusing someone of being unhinged and the courts can then take their guns away. Both bills were put forward by NC Democrats and seem to be essentially the same. 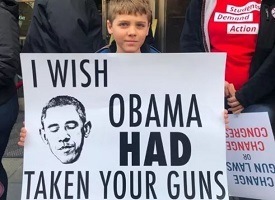 The main difference is that one of them is using NC schools and kids as a reason to enact their gun control wish list. Here are the two bills. Take a moment to look at the language in both of them. House Bill 976 (=S734), Extreme Risk Protection Order (ERPO)Filed version, Edition 1 version. The bill passed the First Reading on 5/22/18 and was sent to the committee on Rules, Calendar, and Operations of the House on that same day. In short, this committee is where bills go to die so it’s effectively dead. Here are the sponsors (all Democrats): Morey; Harrison; G. Martin; Willingham (Primary) Brockman; Ball; Jackson; Butler; Terry; Adcock; Meyer; Farmer-Butterfield; Ager; Autry; John; Belk; Reives; R. Moore; Gill; Fisher; Insko; W. Richardson; Holley. The bill was filed on 5/22/18 and passed the 1st Reading the same day. Two days later, this bill was referred to the Committee On Rules and Operations of the Senate. So, in other words, likely just as dead as HB 976. Sponsors of this one are all Democrats again: Chaudhuri; McKissick; J. Jackson (Primary) Smith; Waddell. Senate Bill 737 asks for more counselors, resource officers and psychologists for schools, but that’s pretty much the extent of anything in it pertaining to ‘safer schools and healthier kids’. Aspects of the bill, called “Safer Schools, Healthier Kids Act,” include allowing the court to take away a gun from someone who was a threat to themselves or others for a period of time, raising the age from 18 to 21 for purchasing an assault type firearm, banning bump stocks, and increasing funding for school resource officers, psychologists, and counselors. In a nutshell, the NC Democrats are trying to get a gun control law and an ERPO law passed any way they can. This latest attempt is using schools and children as a smokescreen to do it. NC Democrats might want to pay attention to the poll at the bottom of an article about their gun-grabby-centric bills over at not even remotely right-leaning WRAL. 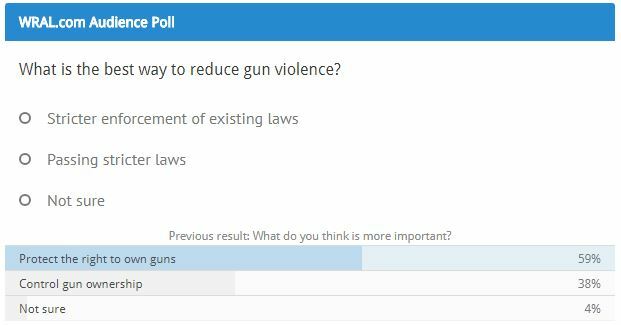 As of May 25th, 59% of those who responded to the question, ‘what is the best way to reduce gun violence’ said that the rights of gun owners should be protected. In theory, such a mechanism like an ERPO might and can be useful but the margin for abuse of such a law is huge. What if someone you crossed one time or an ex-husband or wife decides they want to destroy your life by filing an ERPO complaint alleging that you are “imminently dangerous” simply because you own a gun? The language of the ERPO’s basically ensures that someone can lie about you in a complaint and get away with it. The penalty is only up to 30 days of community service if caught lying in an ERPO complaint. When and if the person is ever cleared of an ERPO, there are other obstacles to overcome. Limited time to respond to an ERPO complaint, which according to the language triggers an instant “Ex-Parte Hearing.” And by instant, they mean immediate – as in any time and day of the year regardless of a court is in session or not. This Ex-Parte Hearing can be held before you have been notified that you have even been accused. If you do manage to get there in time after being notified you can testify to defend yourself, but you could end up having your gun(s) confiscated for a year anyway. According to the bills, the Ex-Parte order would only be valid for a 1o day period but it can be renewed which will lead to another hearing. And possibly another and another. Think of the legal bills and lost income from having to take off from work? Think of your reputation and name being dragged through the mud all because you are defending your 2nd Amendment rights? If the judge hearing the Ex-Parte complaint decides that there is enough evidence for a “temporary” order a person then has 24 hours to surrender their weapons. Once that 24 hours is up, the Sheriff will be dispatched to confiscate them from you. But wait, there’s more. As a result of an ERPO, you will be listed in the national background check database (NICS) as prohibited from owning a firearm. Even if the complaint is allowed to expire, trying to get out of NICS is extremely hard to do. Another tidbit to note is the storage fees for your weapons that have been confiscated from you. Should you happen to be granted your weapons back and get off of NICS, if you cannot pay those storage fees, your guns can be destroyed. The bill does not limit the amount of said storage fees either. It could be tens of thousands of dollars. This entry was posted in gun control, LL1885, NCGA, POLITICS NC and tagged Gun Control Rhetoric, NC Democrats. Bookmark the permalink.